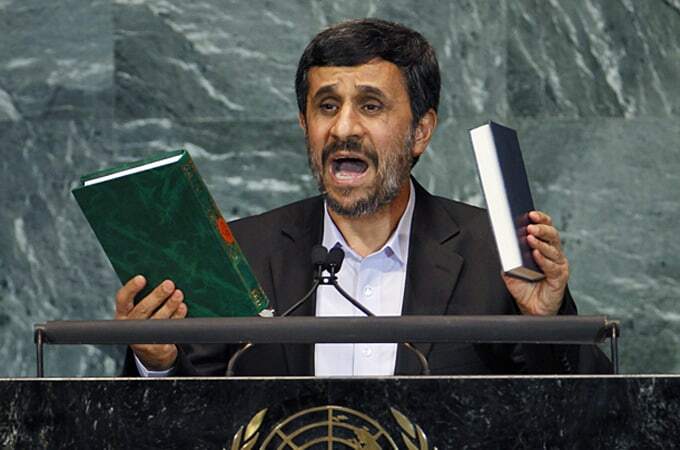 Iranian President Mahmoud Ahmadinejad rendered a humanitarian discourse to the United Nations General Assembly on September 23, 2010. Four minutes of the thirty minute speech triggered the United States Delegation to storm out of the assembly when the President offered three viewpoints on who was responsible for the September 11, 2001 attacks. The President of Iran, by assuming the accepted view of US statesmen, questioned the logic of hundreds of thousands of deaths resultant from the War on Terror. Would it be sensible to have had an independent probe and a “rational plan to take measures against them (the perpetrators of Sept. 11) ? ” he asked. that solutions like Capitalism and Wars on Terror, are extensions of colonialism and materialism; history has demonstrated that mass murders of innocent civilians, usurpation of territories, genocide, increased immorality and ungodliness, and a total disregard for humanity on the whole are symptoms of the failure of these tried systems. That 911 is used to justify the promotion of Islamophobia remains a reality for Muslims who face a growing number of unwarranted suspicions against them. Unbiased investigations about 911 need to be made public. The public has a right to know, and a right to heal. This can only be achieved by outreach- not walkouts. It must be discussed in public forums where the microphones are not damaged, or the files are not lost. The first amendment means access: Freedom of access via speech, congregation, media disbursement and other forms of civil expressions. While other religions anticipate the arrival of Imam Al-Mahdi, peace be upon him, and the comfort and salvation he will bring, Muslims of the Americas have been fully educated about his arrival and prepare to receive him. Allah, be He Glorified and Exalted, bestowed the honor of knowing him upon The Muslims of the Americas through their murshid, Imam El-Sheikh Syed Mubarik Ali Shah Gilani. Imam Al-Mahdi , peace be upon him, is awaited by both Muslims and Christians, not as a Prophet, but as a man of God who will, in these latter days, relieve the people of the world from Satanic oppression. There exists a correlation between the inability of the U.N. (from its conception) to establish a platform for peace AND the injustices that persist worldwide. President Ahmadinejad called on the U.N. to upgrade its organization by restructuring as it is the “key structure for coordinating the common global management.” Imam Al-Mahdi’s, peace be upon him, mission will be a global management for peace, security and the realization of human rights. Could this profound knowledge be what led to the premature exit of ‘missing delegates’ – a puerile means to distract from a poignant message?